I now believe that the hypothesis of a near or medium-term peak in the world's oil supply is confirmed beyond any reasonable doubt. A shift in emphasis that speaks to reducing our demand for oil and examining alternatives to oil is now required. I will be taking that road in the future, leaving specific concerns about the oil supply behind. Today's story briefly summarizes why I believe "peak oil" is a done deal. The forecast1 below reflects my own view. This analysis does not necessarily reflect the view of ASPO-USA. Global oil (crude + condensate) production will peak at 76.5 ± 0.5 million barrels per day (b/d) in 2011, ± 1 year, with a probability of 80%. There is a 20% likelihood that output will peak at another level—not 76-77 million b/d—between 2009 and 2013. This estimate intentionally says nothing about the shape of the production curve after the peak. I stand by this forecast and will not be revising it in the future. A "peak oil" forecast examines the supply-side of the oil market, but reality dictates that high prices will affect demand. My estimate can thus be viewed as a "low price" or "reference" case that ignores the effects of rising prices. See the Summary for a brief discussion. Business Week published Saudi Oil: A Crude Awakening on Supply? on July 10, 2008. Steve LeVine's story should leave us with no doubt about what to expect from the Kingdom in coming years. Mysteriously, this story was not Front Page News in every media outlet all over the world. Business Week received a "detailed document obtained from a person with access to Saudi oil officials." The new information simply confirms what I already knew, but independent confirmation helps us reach firm conclusions. PFC's Roger Diwan, a respected oil analyst, vetted the Business Week document. The data describes Saudi maximum sustainable capacity (table above). Capacity remains around 12 million barrels per day (b/d) for the next 5 years. An important shift occurs which should give us all pause. One dramatic part of the data concerns a site called Ghawar, which has been the kingdom's workhorse field for decades. It shows the field producing 5.4 million barrels a day next year, but the volume then falling off rapidly, to 4.475 million daily barrels in 2013. "That's why Khurais is so important—to make up for that decrease," said the oil industry executive who released the data. The long anticipated decline ("twilight") of Ghawar, the world's largest oil field, is reflected in the Saudi Light data (blue circle). If these numbers are accurate, Ghawar output declines 17% between 2009 and 2013. This works out to about 4%/year for each of the next 5 years. Production of "good oil"—not Manifa heavy sour oil (gray circle)—to offset these declines is supposed to come from Shaybah. Though 2014 is not included in the data, one of the fields listed—Shaybah—is to have a volume increase to 1 million barrels a day that year, from 750,000 barrels a day from 2009 to 2013, according to the oil executive. Khurais and Manifa are very likely the last large (? 1 million b/d) increments that Saudi Arabia will be able to put on-stream—ever. A "paradigm shift" means the Kingdom is not going to knock itself out raising crude oil production to (best case) levels beyond 10.5 million b/d in the medium term out to 2012 or so, and will likely not be able to do so thereafter—Ghawar will not last forever, despite what Mr. al-Naimi or CERA think. Investment in additional capacity available after 2011 would have to be on the drawing board now, but there is no indication that Saudi Arabia has thought that far ahead. The Saudi peak is now in sight. Saudi Arabia is the only OPEC member that can raise production by any significant amount in the medium-term to 2013. The longstanding argument about the Saudis is over. Oil supply growth outside of OPEC has slowed considerably in recent years despite a long list of new projects. Unfortunately, the amount of new oil coming on-stream looks better on paper than it does in actuality. In February of this year, the EIA released its Outlook For Non-OPEC Oil Supply Growth in 2008-2009. The forecast boldly stated that the oil supply coming from outside the OPEC cartel would be 2.4 million b/d. 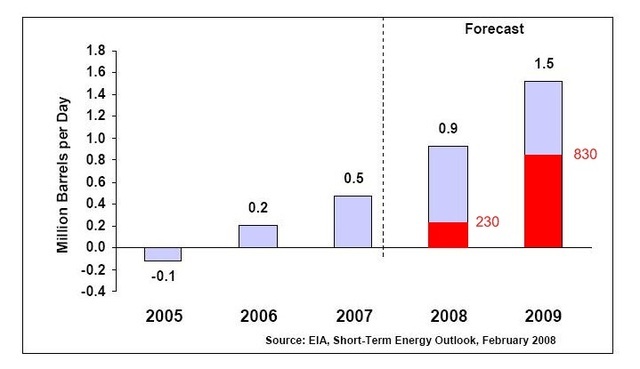 The EIA has now revised their forecast as shown below (STEO, June 8, 2008). The revised numbers (in thousands of barrels per day) are shown in red. In my now inaptly titled These Are The Good Years, I shaved 1 million b/d off the EIA's numbers (ASPO-USA, February 20. 2008). Even this downward revision was insufficient. The EIA now puts growth at 1.06 million b/d for both years combined. Apparently I was overly impressed with paper barrels. It is not a mistake I intend to repeat. Predictably, the EIA has pushed most of the growth into next year. They are still playing the pollyanna game. In my Good Years column, I reviewed all the reasons why the EIA and other analysts have been overly optimistic about non-OPEC output. Delays are one factor, but the main reason for lowering forecasts is the overall non-OPEC production decline rate, and underlying rates for particular countries like Brazil or Norway. Now comes news that the International Energy Agency (IEA) has recalculated the global decline rate. Project delays averaging 12 months, coupled with global average decline of 5.2% - up from 4% last year – are the factors behind these revisions. Over 3.5 mb/d of new production will be needed each year just to hold global production steady. “Our findings highlight again the need for sustained, and indeed, increased investment both upstream and downstream -- to assure that the market is adequately supplied,” stated [Nobuo Tanaka, IEA Executive Director]. It is crucial to understand that the decline rate outside of OPEC is higher than that within the cartel because non-OPEC oil includes the United States, the North Sea, Mexico, and other countries on the downslope of their production curves. Thus, the IEA revision can only mean one thing: non-OPEC declines are accelerating. This is the main reason behind the EIA revision. I am now going to switch gears and look at some data from the IEA's 2008 medium-term report covering the years 2008-2013. You can plainly see in the IEA's data why I called my review of the EIA's forecast These Are The Good Years (click to enlarge, look left). The data also reflect the peak of Russian oil production, for no "key non-OPEC increment" is listed for the world's largest producer outside Saudi Arabia. I also believe the addition from the Canadian tar sands (ASPO-USA, January 2, 2008) has been overstated—it is the largest addition! A significant part of Brazil's large contribution comes from increased sugarcane ethanol production. I am going to revise the IEA's forecast. First, I'm going to toss out their prediction for 2013. If we can't estimate next year's non-OPEC additions, how can we make a specific forecast for 5 years from now? Taking a closer look at the data, we see that OECD declines are minimal in 2009 and 2013. The 2009 estimate is understandable in light of the fact that both Atlantis and Thunder Horse are now on-stream in the Gulf of Mexico. Both fields will hit their maximum capacity (450,000 b/d combined) later this year or next year. The 2013 estimate can not be trusted, however. Even if there are scheduled additions in the Gulf of Mexico in that year that compensate for OECD declines, we should keep in mind that both Atlantis and Thunder Horse were subject to 3-year delays beyond their initial start-up dates. The 2013 addition is suspect, and does not affect my peak estimate in any case. Second, I am talking about crude + condensate, so I will toss out the ethanol, natural gas liquids (NGL) and refinery processing gains included by the IEA. After revisions, I believe the net addition is approximately 500,000 b/d for the medium-term. If 2008-2009 are not the good years, and apparently they are not, then no amount of highly profitable light sweet crude from places like Ghana will save us. 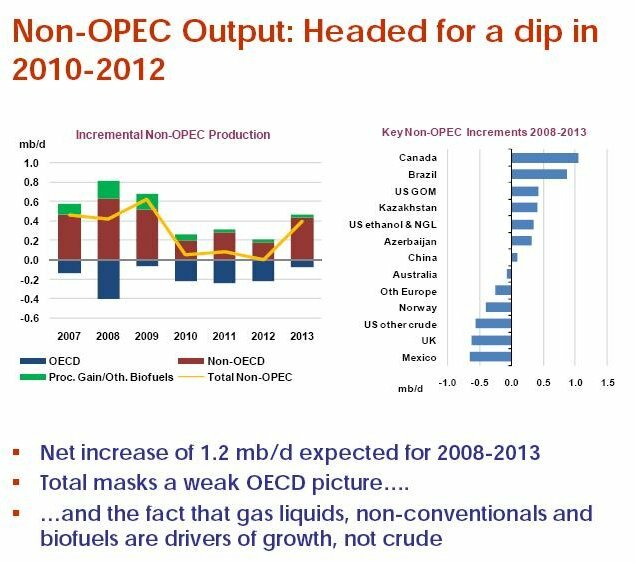 The non-OPEC crude + condensate peak in 2010 is all but assured. We have figured out what to expect from the non-OPEC countries, and we know what to expect from Saudi Arabia. It is now a simple matter to figure out what the contribution from the rest of OPEC will be, add up all the increments, and make our "peak oil" prediction. The next graphic shows the IEA's take on OPEC growth in the medium-term (below, click to enlarge). 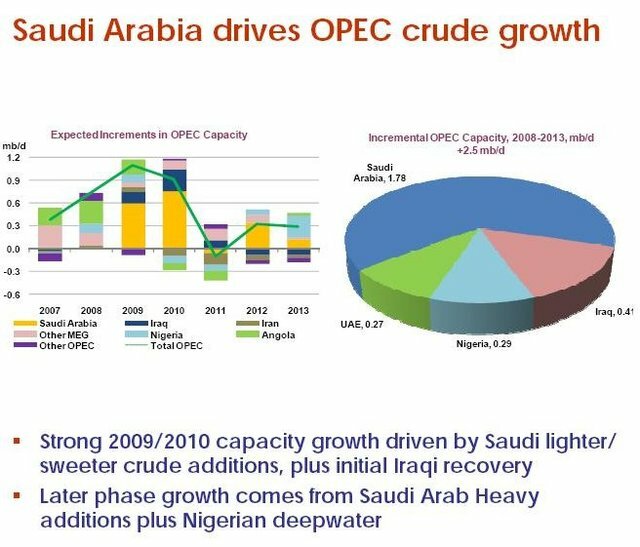 The IEA's data shows that OPEC capacity rises 2.5 million b/d in 2008-2013, but we must revise that number based on the new Saudi data. In its June Oil Market Report, the IEA puts Saudi capacity at 10.65 million b/d. If we add 1.78 million b/d to this number (graph above), we get 12.43 million b/d. But we know that Saudi capacity never exceeds 12 million b/d in the medium-term, so the IEA has overstated that capacity addition by 0.43 million b/d. If the total OPEC addition is 2.5 million b/d, then the revised number is now 2.07 million b/d and the Saudi addition is 1.35 million b/d. Regardless of the Saudi contribution, the "rest of OPEC" contributes 0.72 million b/d of new production capacity in 2008-2013. In the IEA's pie chart (graph above, right), the numbers do not add up to the supposed total addition of 2.5 million b/d. This "miscalculation" is understandable in view of the impossibility of assessing future additions from Iraq or Nigeria. Now is not the time to get into a heated argument about whether "peace will break out" in Iraq or Nigeria allowing some production increases. I am going to accept the IEA's number of an addition of 0.72 million b/d outside of Saudi Arabia. I am now in a position to add up the production numbers arrived at above, but first I need to establish a baseline. I will use the EIA's data (here and here) for May, 2008. The EIA's 4-month average for 2008 is 74.325 million b/d. Saudi production in May was 9.4 million b/d, up 300,000 b/d from April. I will add those barrels to the 4-month average to obtain a baseline of 74.625 million b/d. We can now add our additions to the baseline. The non-OPEC increment is 0.5 million b/d, the Saudi increment is 1 million b/d, and the rest of OPEC increment is 0.72 million b/d. Together, these yield 2.22 million b/d. Adding this to the baseline, we get 76.845 million b/d. If you look back at both of the IEA charts, you will see that OPEC capacity additions fall off considerably in 2011, while non-OPEC additions drop after 2009. My view is that after 2011, we will never surpass production levels achieved that year. The oil price is rising quickly. The higher prices preceding the peak are now dampening demand in the United States and elsewhere in the OECD. However, subsidized consumption growth outside the OECD (China, etc.) is still soaking up demand reductions elsewhere. I can not predict future oil prices with any certainty, and I can not predict future oil demand with any certainty, although I have discussed these subjects at length in other columns. Obviously, I can not predict the exact shape of the world oil production curve in the next 5 years. What I can do, however, is establish a ceiling for world oil production should demand remain strong going forward. That ceiling, now and forever, is likely to occur in 2011 somewhere between 76 and 77 million b/d. We are so close to the peak now that quibbles about the numbers cited here do not matter. My familiarity with the oil industry justifies many of the "hidden assumptions" I've made and did not have time to discuss. If you remain unconvinced that a peak of world crude oil production is not almost upon us, nothing I could say further will persuade you in any case. As I said at the top, this is my official forecast and I will not revise it in the future. I will note for the historical record that in July of 2008 few Americans have come to grips with the implications of a permanent peak in the world's oil supply despite the strong price signal we've seen for several years now. I have done all I could over the last few years to warn everyone about what's coming. My conscience is clear even as my concern remains high. For me, the time has come to examine measures we might take in the post-peak world.